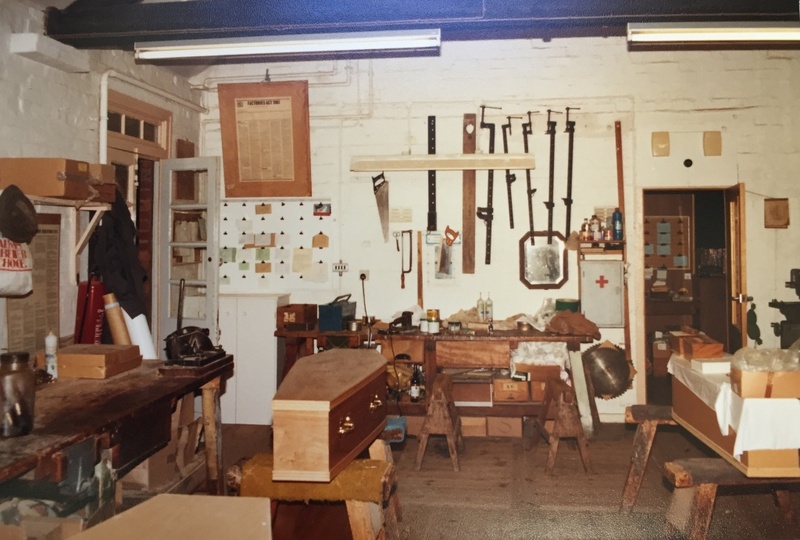 In the 1920’s when the business was first started by Harold, my great grandfather, all the coffins were made by hand from butts of elm and oak, we had heavy duty saws, planes, lathes and various other machinery to help us manufacture the coffins. 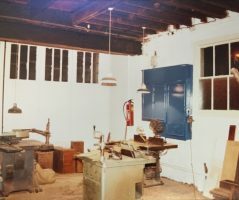 It took approximately a day of one man’s resource to make each coffin and once finished each coffin was then carried upstairs to be polished, lined and finished with handles. 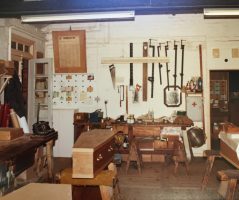 We continued to make the coffins until 1986 when it became impossible to keep up with the demand and our skill wood workers had all retired. 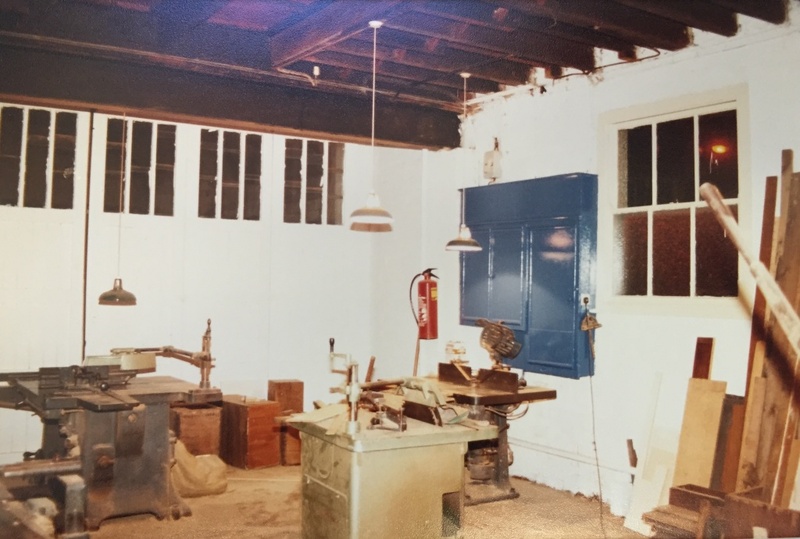 Most of our machinery was donated to a local museum, so it would continue to be part of Swindon’s history as were unable to continue storing it at our workshop. 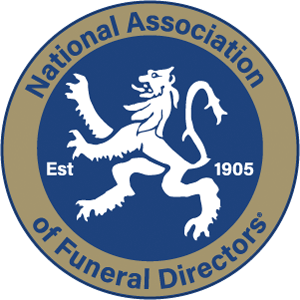 Today our coffins are purchased from a local manufacturer as a shell and are still fitted out by our staff. 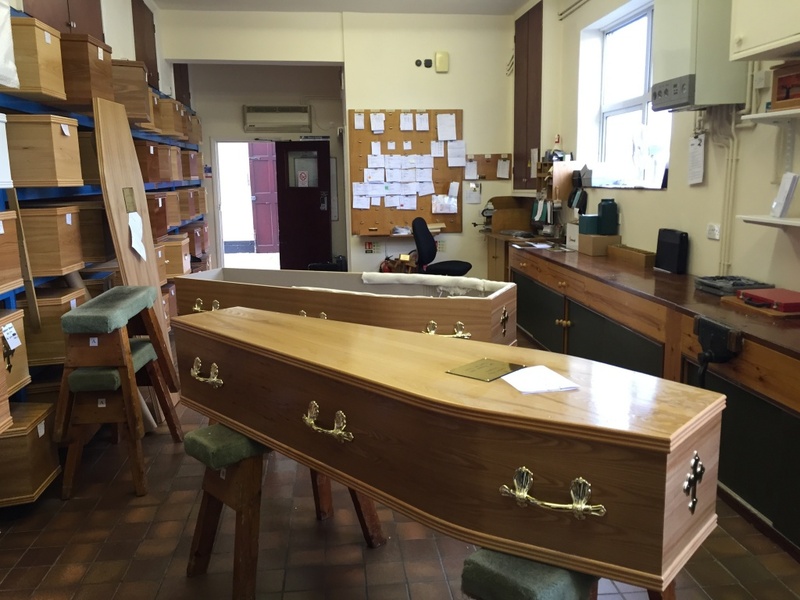 The traditional coffins today bought in are elm & oak veneer, solid oak, mahogany and MDF with a colour finish. 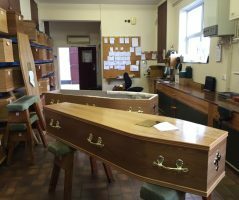 After every removal we carry out whether it is from a private address or a hospital every person we take into our care is measured for their coffin. 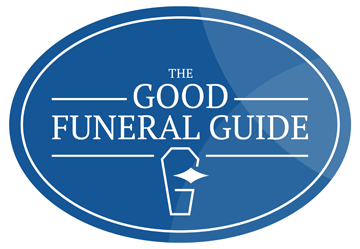 We would never force someone into a coffin that is simply too small for them and we keep coffins ranging from 5’8 to 6’6 in stock and can order in other sizes if needed. The way we hand finish the coffins today is the same process we have used throughout the company’s history. I will take you through the process now, firstly we engrave a name and foot plate and affix them to the coffin. Taking into account any special requests such as if the person’s name is Gerald but they were always known as Gerry and also adding any religious symbols if required. Next we sand down the rough edges of the coffins and turn the coffin over to seal the bottom with a mixture of black paint and PVA glue to cover any dust. All exterior fittings are fixed into place using various templates to ensure a seamless finish. We offer a wide range of handles and matching end pieces which are available in brass or plastic depending on whether a burial or cremation has been booked. Wadding is used to form a soft base and a hand rail on the sides. The amount of wadding used depends on the quality of the coffin purchased. Satin linings are fixed into place and quilted underlining’s are added. All our linings are available in different colours and we finish each coffin with a quilted satin pillow.